Once you have your quotation written, you can move to the top of the page to the sketch area. The sketch box is free flowing area to sketch an idea, create a process, add a mind map or just put down a word or two for motivation. Depending on the day and the project you’re working on, you can start out the day with a visual idea. If you are at a loss for ideas, just write out a word in big letters for inspiration. Action verbs usually work great motivation. Once you have the quote down and a sketch, You’re ready for a simple action list. The worksheet has a place for six different items. Depending what you put in the sketch area, you might list out a step by step plan for a mind map, a few items for a process your working on, or just a simple to-do list to start the day. Once everything is filled in, just leave the sheet in an area on your desk where you can see it throughout your morning. Keeping your positive ideas in a visual location will help keep them top of mind. 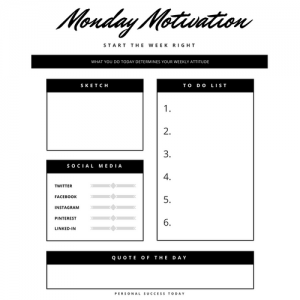 If you are active on Social Media, you may want to share your Monday Motivation with the world. The sheet has a short list of popular social sites where you can post your quote, idea, or picture with the world. It’s easy to create a quote graphic in your favorite graphic program to share with others. I’d love to hear how you use this sheet and any feedback for tweaks or mods. Just leave a comment below.